A well-cut diamond reflects light within itself, from one facet to another, as well as through the top of the diamond, bringing out its spectral brilliance. The cutting and polishing of a diamond crystal always results in a dramatic loss of weight; rarely is it less than 50%. Sometimes the cutters compromise and accept lesser proportions and symmetry in order to avoid inclusions or to preserve the carat rating. After a stone has been cut, it is then polished and classified again, according to the 4Cs: Colour, Carat, Clarity and Cut. 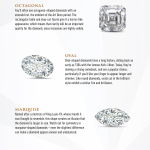 Due to each stone having its own unique characteristics, diamonds are non-fungible and their value can vary significantly based upon the many variances of the 4Cs mentioned above. For more information on the 4Cs, go to the GIA website. The most popular cut favoured by jewellers is the round ‘brilliant’ cut, which maximises light reflectivity from the facets. The brilliant cut also utilises the natural octahedral shape of most diamonds, so the cutter can take advantage of the planes of weakness to cleave the diamond and minimise cutting and polishing time. Brilliant cut gem diamonds are particularly favoured in diamond engagement rings.